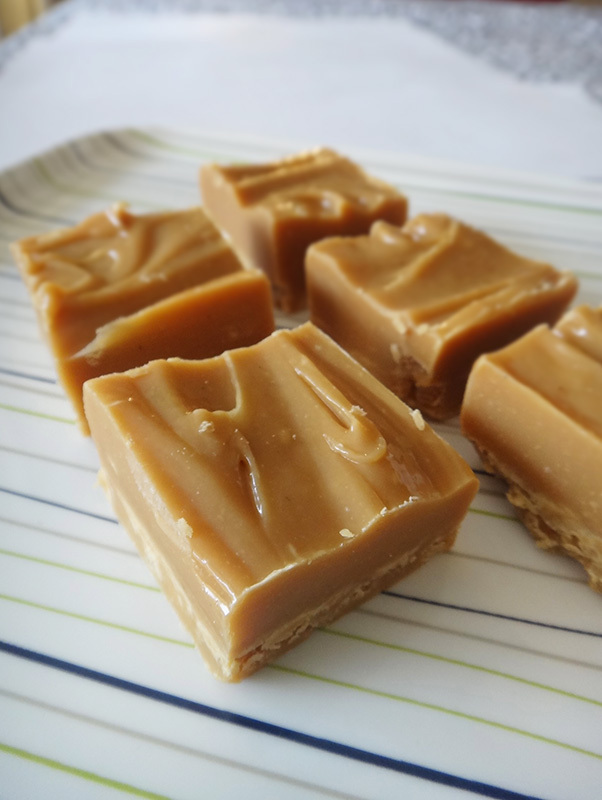 Note: I feel I should point out that this recipe produces a slightly chewy, caramel-like fudge as opposed to the crumbly, traditional fudge that some people may prefer. The Thermomix simply can’t heat sugar up to the temperature required for traditional fudge. However, if you aren’t confident with candy-making on the stove, then I consider this recipe a great way to achieve something pretty darn close to fudge with the Thermomix. For more traditional fudge recipes, try my Dark Choc & Early Grey Fudge or Lemon Tea Fudge :) Otherwise, this Thermomix caramel fudge is pretty special! One of my earliest posts on Gastromony was about the trials and tribulations of fudge making. I called that post “For Fudge’s Sake” because it pretty much sums up how frustrating working with sugar can be, particularly when making fudge. For every great batch of fudge I’ve made, another has failed miserably. Curiously it was Tenina Holder’s book For Food’s Sake that put an end to my cursing over failed fudge. I never thought the Thermomix could produce traditional stovetop candy but I was proven wrong (but happily so). I tried Tenina’s recipe for Chocolate and Maple Fudge and I was utterly amazed by the superb texture of the fudge. No graininess. Not too soft and not too hard. Perfect! 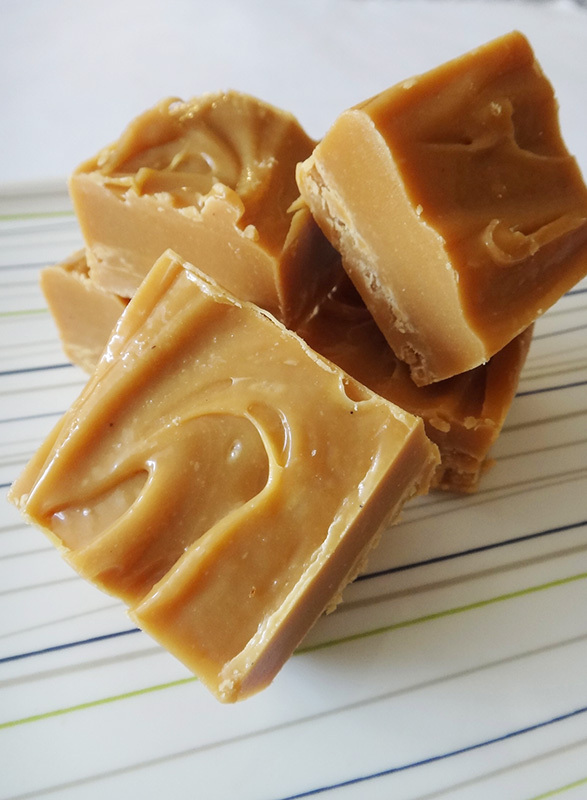 Utterly inspired, I’ve gone on and made other types of fudge (like Chocolate and Peanut Butter Fudge for this year’s inaugural Sweet Swap ) but my favourite so far has been plain caramel fudge. I’m always tempted to add some sort of flavour or ingredient to each batch but every single time I end up keeping it simple. I do like flavoured fudge (I made some Lemon Tea and Earl Grey ones) but it’s hard going past good ole caramel. The recipe is super simple; so simple that in spite of being in the throes of moving house, I was able to spoil my family last night with a serving of fudge as well as start this post! 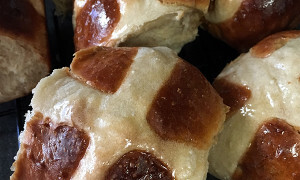 Just as well as blogging is going to have to take a back burner this week :( The recipe is also pretty much fool-proof so I won’t be in a hurry to make stovetop fudge so long as my Thermomix is in working order. I have adapted Tenina’s original recipe, more or less to accommodate the 100g portion of chocolate that is commonplace. I often have one bar of some sort of chocolate, and rarely two. 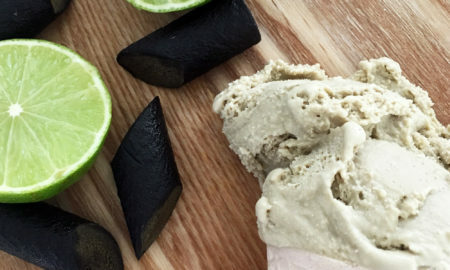 I highly recommend finding Green & Black’s white chocolate (it already contains vanilla) or any similarly good quality white chocolate that has a high cocoa butter content (I think 30% is best). It will be more expensive but definitely worth it as you’ll avoid the graininess. Do not use Nestlé or Cadbury’s white chocolates as you’ll end up with gritty fudge. In fact, avoid any lesser quality chocolate when making Thermomix fudge. Place caster sugar, salt, condensed milk and butter into TMX bowl and cook on 70C on Speed 3 for 10 minutes. 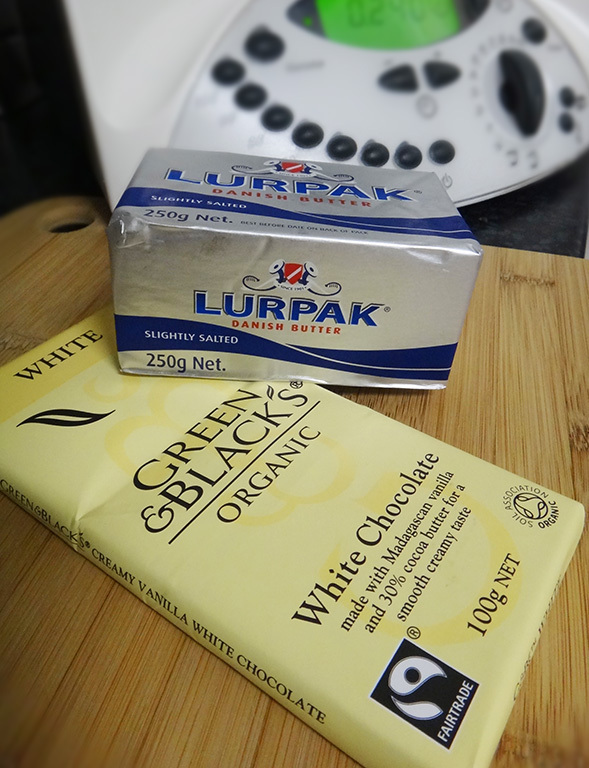 Add white chocolate to TMX bowl and cook for a further 15 minutes on 100C/Speed 3. Cook fudge for 35 minutes on Varoma/Speed 2. Carefully take off lid and remove excess water from lid. Replace lid then blend up fudge on Speed 6 for 2 minutes. Spread fudge into a lined container and allow to set in fridge once cooled down a bit for at least 2 hours. Slice into squares and keep in fridge. Thanks for the recipe! I made this tonight. My woolies only had Lindt white chocolate tho (or milky bar?!) So hopefully it turns out ok. Smells great!! Thanks Christina :) It’s deadly sweet but just one piece cures all ills for me! Hi Michele! This recipe is not for a traditional fudge. To make the ‘real deal’ you do need to make it on the stove top and get the sugar heated to a much, much higher temperature. 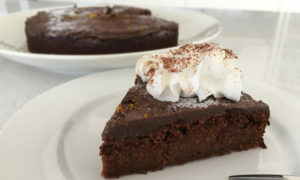 This recipe is great for those who want a quick fudgy fix in the Thermomix and/or are nervous about handling hot sugar. My first two batches were perfect and I was so excited! However the next two were disasters – the first disaster was a gooey grainy caramel, and the second a rock hard toffee like one. I followed the recipe and instructions exactly every time. Confused as to how I got such varied results…? Any suggestions? Hi Claire. I’m glad your first two worked great otherwise it would be really disappointing! Grainy usually means that the chocolate used didn’t have a high enough cocoa butter content and contained more milk solid in its place. Did you change chocolate brand at all? Other than that anything from too much humidity to just too much condensation falling into the fudge mix can make a difference. Please let me know if you still have problems! this did not make fudge. good flavour. wrong consistency. too dense. too sticky. Hi Andrew. I’ll agree that it’s not traditional fudge but there’s no way of making that in the Thermomix. This is simply a way to make something similar without sitting at the stove top. If you’re not comfortable playing around with hot sugar, it’s a good compromise. Do you have any way of making banana fudge in the thermomix? i want to make them for christmas presents. How many squares can i get out of your written recipe? Greetings from Germany! My fudge melts once in room temperature. Is this normal? Can i salvage it? Oh My Word….AMAZING. So yummy!! Mine is silky smooth and absolutely to die for!! Will definitely make this again. YUM!!! Really nice but next time Im going to have some green apples (wax carefully washed and polished off) on sticks at the ready- I think this will make the most AMAZING caramel dipped apples- I have been searching for a recipe for this ‘jersey’ style caramel for years after having caramel apples on a trip to the USA.- I will let you know how I get on! hi, what does it mean by “removed excess water”? my fudge is cooking now and im so excited! Hi there. Sorry to not be clear. I mean the excess water that builds up inside the lid. Rather than let it drip back into the bowl, I like to shake the lid out in the sink to get rid off the moisture. Hope your fudge came out delicious!